Firefly and Stagecoach Present Big Barrel Country Music Festival. 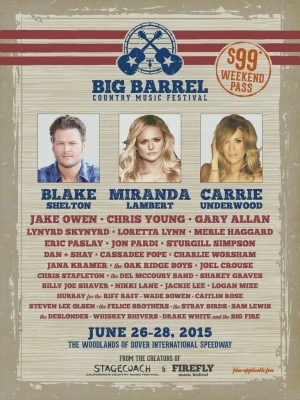 Big Barrel Country Music Festival will take place in 2015 from June 26-28 at The Woodlands of Dover International Speedway, where the annual Firefly Music Festival is held in Delaware. Hosted the weekend following Firefly, the festival will provide a similar world-class experience featuring headliners Blake Shelton, Miranda Lambert and Carrie Underwood. Additional artists include Jake Owen, Chris Young, Gary Allan, Lynyrd Skynyrd, Loretta Lynn, Merle Haggard, and over 40 more. Three-day general admission passes are $99. In addition to three days of country music’s top performers, attendees will be introduced to a wide variety of attractions within the festival and campgrounds. Highlights include, but are not limited to, a large-scale Dance Hall, BBQ area, Saloon, marketplace with a variety of western goods and products, as well as a family-friendly area. Passes on sale for Big Barrel Country Music Festival today at Noon EST through BigBarrelFestival.com. Camping options include Corral Club, which includes a private air-conditioned tent, RV packages and tent camping. Payment plans available. Complete festival information at BigBarrelFestival.com. Big Barrel Country Music Festival is a chance to kick back with friends and family for a rowdy summer weekend. Drop the tailgate, pop open a cold one and enjoy three days of America's favorite country artists.